Two Baldwins shuffle cars for SMS Railroad not far from the Conrail interchange (AS616 554 at right) and the Home Depot warehouse (DS4-4-1000 9069 at left). Both cuts of cars are in motion, and that kind of move is made possible by efficient staffing. Both the conductor and engineer of today's crew are qualified as engineer and conductor, and can perform either craft as necessary. 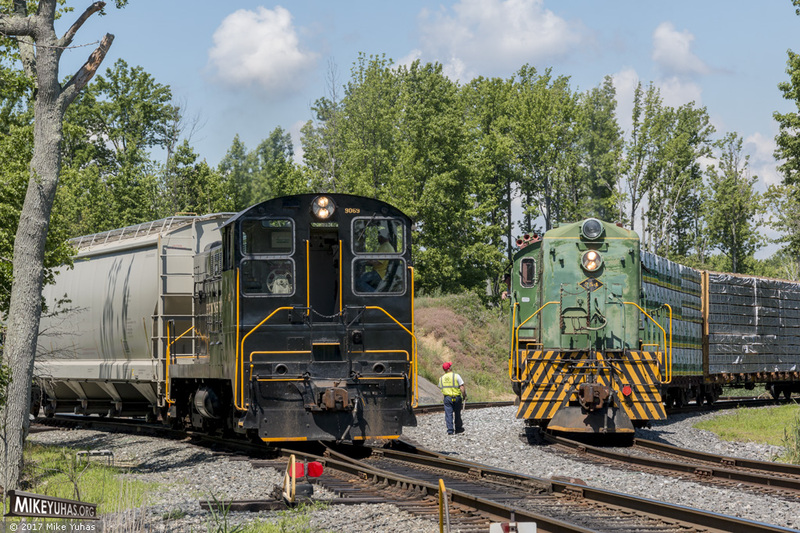 Engineer Rick is spending most of the day in the 9069, and conductor Jim is, for now, behind the throttle of the 554. Brakeman Jim (a different Jim) is protecting the shove of cars out of sight to the left, while utility man Chris is helping with the 554's activity.